Applications must be filed with the Parade Chairman to enter the parade. Applications must be submitted on line. Applications for all entries must be received by NOON, Wednesday before the fair. While every reasonable precaution will be taken for safeguarding participants entered in parade the owner assumes all responsibility for any accident, loss or damage that may occur. The Kiwanis Ogeechee Fair Parade is a family oriented event. All costumes and performances will be designed as such. Any lude or suggestive dance movements will not be tolerated, and group will be asked to leave the parade route immediately. Offending group members will be banned from future parades until he/she has been reinstated by a majority vote of the Fair committee. All floats participating in the Fair theme competition will be judged for prizes. Float attendants are permitted but are not necessary. Indicate: “Theme Float” on application to be in competition. Judges will be appointed by the Parade Committee and certified by the Fair Committee. 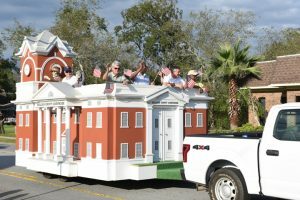 A float is described as a “low, flat decorated vehicle and/or trailer entered in a parade for transporting an exhibit which conveys a message or a group”. Floats may be towed by tractors, cars or pick-up trucks. Tractor-trailer rigs (combos) will not be allowed in the parade. All drivers must submit an insurance and driver’s license verification form prior to participation in the parade. Entries other than a float, such as a truck or automobile, are permitted if applications are filed with the Fair Parade Chairman, but will not be judged for prizes. Company logos may appear on these vehicles only as sponsors of entry. Entries exclusively for advertising purposes will not be allowed. No more than eight (8) persons on an entry other than a float, including the driver. Absolutely no throwing of candy or other material from any vehicle in the parade. It is permissible to hand candy and material directly to those at the curb line. 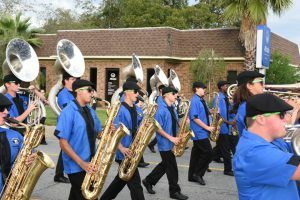 If your group is performing in the parade and you need to stop several times during the parade to perform, be sure that your performance does not cause a backup of the units following you or leave a large space in the parade procession. Stops of 30 seconds or longer are excessive delay of the parade progress. Please consider that this is a family oriented event and all participants are expected to be costumed and present themselves to all ages of our viewing families. Horses will be allowed in the parade. For further information, please contact Holli Deal Saxon at 489-9414 or 865-2352. Walking animals are permitted, if on a leash, and they will be placed near the end of the parade with the horses. Floats must be in parade position no later than 4 pm, Monday, October 15th, 2018. Other entries must be in place by 4:30 pm. Winners in float competition will be notified after the parade by email. Any group participating that has small children must have a vehicle directly behind their group to allow the children to ride when they get tired. You may allow part of the children to ride while others are walking. If your group of small children will not be able to walk the full-length parade route to College Plaza you may contact Charles Sheets for optional departure locations and make proper arrangements for pick up by the responsible adults. All participants must have their line-up number posted to their group both front and back in 6” numbers. Line-up number will be furnished when you are given your position in the parade. This may be late in the week before the event, after the application deadline has passed. Participants with small children must have a pickup vehicle at the end of the parade as well as within the parade.